Actor Chris Pine and Academy President Cheryl Boone Isaacs announce the film “Birdman or (The Unexpected Virtue of Ignorance)” as a nominee for best picture at the 87th Academy Awards nominations at AMPAS Samuel Goldwyn Theater on Jan. 15 in Beverly Hills, California. The Oscars are coming! We’re just over two weeks out. By Monday morning, though, we’ll have enough data to get a vibe for the real contenders for best picture. Two awards ceremonies this weekend have historically done a decent job of predicting the Oscars: the Directors Guild of America awards (Saturday) and the BAFTA Film Awards (Sunday). I’m agnostic when it comes to “predicting” the Academy Awards with any real confidence; there simply isn’t much relevant data. No one polls Oscar voters. Betting markets — such as Hollywood Stock Exchange, which has “Boyhood” leading the pack for best picture — are probably your best bet. But other awards shows have been mildly predictive. Two years ago, my colleague Nate Silver cooked up a model that looked at how reliably earlier, lesser award shows predicted the big dance. It combined the rate that award shows had the same winner as the Academy Award in the top categories, as well as whether the award show was voted on by outsiders (like the press) or insiders (like actors and directors, the people who are also members of the Academy). Nate’s model also gave out credit to films that were nominated for each award — a fifth of the credit for each nomination. 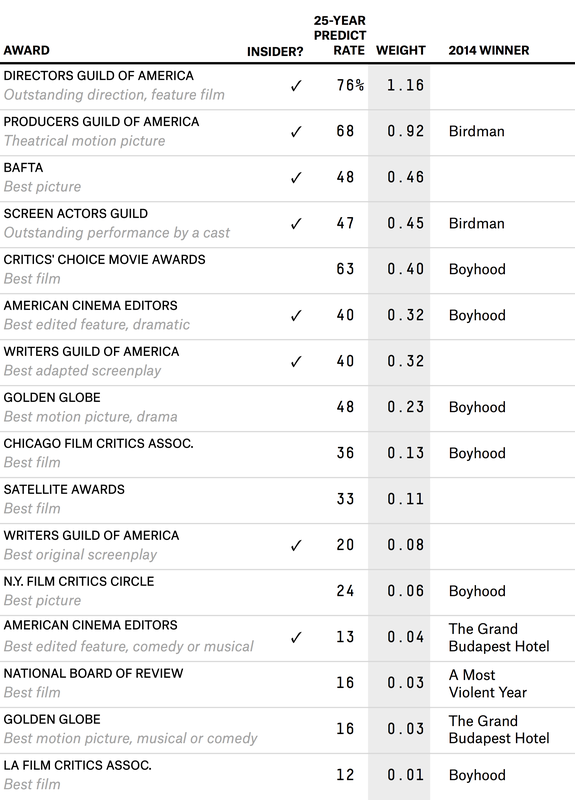 “Boyhood” has the most awards, but a lot of them don’t have a ton of predictive power. Its nominations are worth 0.85, and its wins are worth 1.15, so it’s sitting at a 2.01 (these scores don’t have a unit). Then “Birdman or (The Unexpected Virtue of Ignorance)” — which wins the Hickey Award for most annoying full title — has only won two of the listed awards, but they’re biggies. “Birdman” took home top honors at the Screen Actors Guild and Producers Guild of America awards, both of which have some pretty decent predictive power. Its nominations are worth 0.73 points, its wins are worth 1.37 points, and it’s leading the pack with a score of 2.11. “The Imitation Game” and “The Grand Budapest Hotel” each have scores between 0.8 and 0.9, and the rest of the films are below 0.55. That ranking could change a lot after this weekend, when we have the DGA and BAFTA prizes, two of the top four predictive awards. If a trailing film, such as “American Sniper” or “The Theory of Everything,” wins the DGA, it’ll be in spitting distance of “Birdman,” according to this model. What this means is that on Monday, we’re going to have a much, much better picture of what this Oscar race looks like.